The news on Deferred Action for Childhood Arrivals (DACA) is constantly in flux, making it even more important for universities to stay on top of recent updates and potential changes. DACA is an immigration policy that allowed some individuals (brought to the United States illegally as children) to receive a renewable two-year period of deferred action from deportation and become eligible to work in the U.S. Announced in 2012, this policy does not provide a path to citizenship for recipients. CU Denver Business School’s diverse student population establishes CU Denver as a leader when it comes to working with DACA students and potential employers. Stephanie Sindt of the school’s Business Career Connections office (BCC) recently conducted a national webinar for the MBA Career Services & Employer Alliance (MBA CSEA). Along with speaker Lisa York, an immigration attorney from McGuide & York Law, they discussed what DACA updates schools, employers, and students needed to know. In particular, Lisa talked about the importance of local resources and working with qualified professionals to make the employment process as seamless as possible, despite the level of uncertainty around the program. 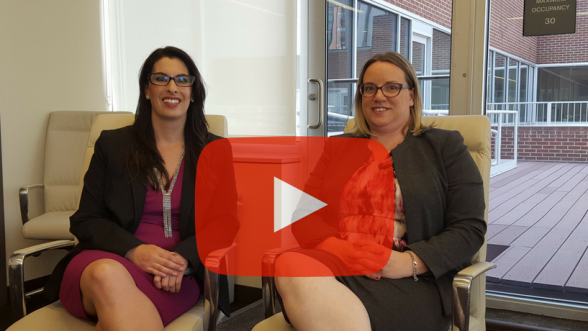 Stephanie Sindt and Lisa York discuss advice for both DACA students and potential employers.